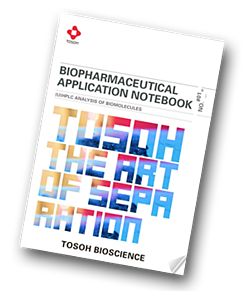 Tosoh Bioscience has produced Volume 1 of its 'Biopharmaceutical Application Notebook' for the (U)HPLC analysis of biomolecules. This essential application notebook will keep you informed of all the latest developments in the biopharmaceutical industry using both high performance liquid chromatography and ultra-high performane liquid chromatography — the analytical workhorses of the pharmaceutical industry. Why is thorough characterisation of therapeutic biomolecules so important? Today, biopharmaceuticals are the fastest growing product segment of the pharmaceutical industry. A thorough characterisation of therapeutic biomolecules is a key task for the successful submission of data for regulatory approvals of new drugs, no matter whether biologic, biosimilar or biobetter. Quality control needs effective analytical tools that allow fast determination of critical quality attributes of the various kinds of biopharmaceuticals, such as monoclonal antibodies (mAbs) and other therapeutic proteins. With new biopharmaceutical formats, such as bispecific mAbs, antibody fragments and antibody-drug-conjugates (ADCs) in the pipeline, rapid and thorough characterization will become even more important. What is covered in the 'Biopharmaceutical Application Notebook'? This application notebook compiles more than twenty application notes covering important aspects of biopharmaceutical analysis such as protein aggregation, charge isoforms and glycosylation as well as determination of drug-to-antibody ratio (DAR) of ADCs. The last section of the notebook provides tips and tricks to improve chromatographic separation of biomolecules. Download your copy now and keep informed of all the latest developments in the biopharmaceutical industry.